This spectacular horse racing collectible commemorates the last four Triple Crown winners, Secretariat, Seattle Slew, Affirmed and American Pharoah. 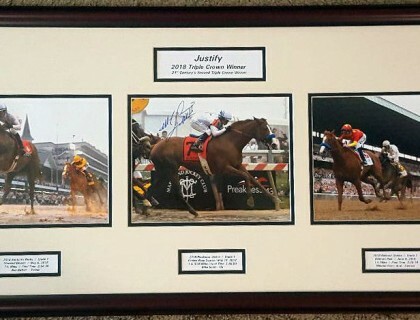 This framed item features four 8" x 10" custom photos of the finish of each winner's Kentucky Derby signed by the winning riders Ron Turcotte, Jean Cruguet, Steve Cauthen and Victor Espinoza. These signed photographs are double matted in gallery level mat board. Finished in a mahogany frame moulding measuring 25" x 26" approx. This item is a great fit and ready to hang in your home or office. Secretariat, Seattle Slew, Affirmed and American Pharoah were and are racing's greatest stars and collectibles like these often appreciate significantly over time. Comes with certificate of authenticity for all signatures. Free Shipping and insurance to all U.S. addresses. Decade of Champions. This spectacular horse racing collectible commemorates the last three Triple Crown winners, Secretariat, Seattle Slew and Affirmed. This framed item features three 4.75" x 6" custom photos of the finish of each winner's Kentucky Derby signed by the winning riders Ron Turcotte, Jean Cruguet and Steve Cauthen. These signed photographs are double matted in acid free gallery level mat board. Finished in a mahogany frame moulding measuring 12" x 26". This item is a great fit and ready to hang in your home or office. Secretariat, Seattle Slew and Affirmed were racing's greatest stars and collectibles like these often appreciate significantly over time. Comes with certificate of authenticity for all signatures. FREE SHIPPING & INSURANCE for all U.S. addresses. Zenyatta Breeders' Cup Commemorative This impressive collectible features three 8" x 10" custom photos of the champion mare, one from the 2008 BC, one from the 2009 BC and a poignant center photo of Mike Smith celebrating the 2009 win. The center photo is signed by Mike Smith. These photographs are double matted in acid free gallery level mat board with corresponding key ways featuring the Breeders' Cup colors (purple/yellow) and highlighting each race and Zenyatta's lineage. And finally this collectible is custom framed in a gorgeous mahogany molding. This is a spectacular piece for any Zenyatta fan!!! Overall size: 18" x 38". Price: includes insured delivery for all U.S. addresses. 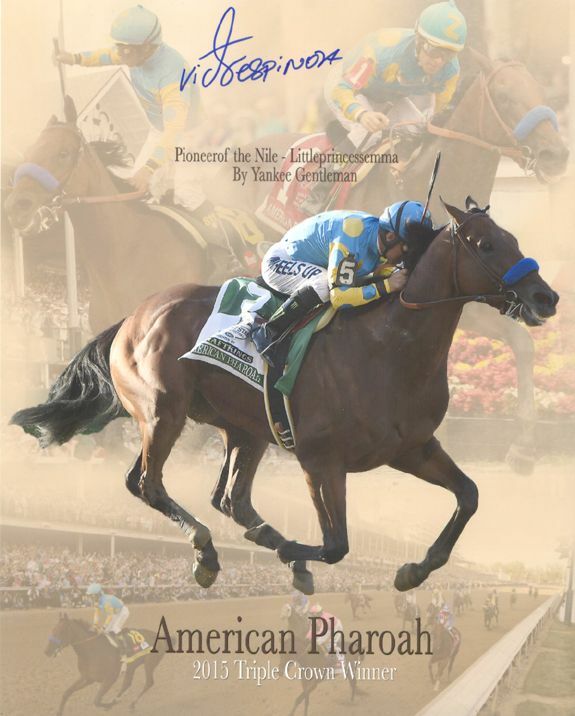 This spectacular horse racing collectible commemorates Triple Crown winner Affirmed. This framed item features three 4.75" x 6" custom photos of the finish of each of the Triple Crown races. Hand signed by Steve Cauthen. These signed photographs are double matted in acid free gallery level mat board. Finished in a mahogany frame moulding measuring 12" x 26". This item is a great fit and ready to hang in your home or office. Affirmed was one of racing's greatest stars and collectibles like these often appreciate significantly over time. Comes with certificate of authenticity guaranteeing the signature permanently and unconditionally. FREE SHIPPING & INSURANCE for all U.S. addresses. 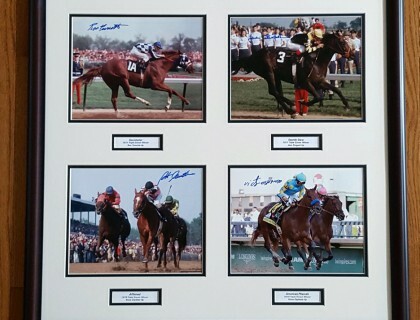 This is a photo collage of thoroughbred racing's last 3 Triple Crown winners, Secretariat, Seattle Slew and Affirmed. 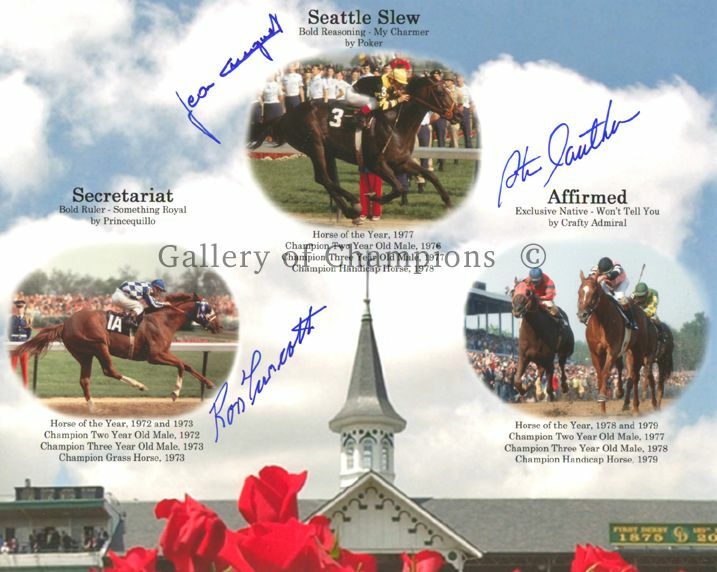 This gorgeous item has been hand signed by the 3 winning riders, Ron Turcotte, Jean Cruguet and Steve Cauthen and comes with our certificate of authenticity permanently and unconditionally guaranteeing the signature as authentic.This is a photo collage of thoroughbred racing's last 3 Triple Crown winners, Secretariat, Seattle Slew and Affirmed. This gorgeous item has been hand signed by the 3 winning riders, Ron Turcotte, Jean Cruguet and Steve Cauthen and comes with our certificate of authenticity permanently and unconditionally guaranteeing the signature as authentic. Dear Horse Racing Treasures, Love the site! Very easy to use and the products are unique. I am looking forward to seeing new products in the future. This is a site I will definitely tell my friends about. This spectacular horse racing collectible commemorates Triple Crown winner Secretariat. This framed item features three 4.75" x 6" custom photos of the finish of each of the Triple Crown races. Hand signed by Ron Turcotte. These signed photographs are double matted in acid free gallery level mat board. Finished in a mahogany frame moulding measuring 12" x 26". This item is a great fit and ready to hang in your home or office. 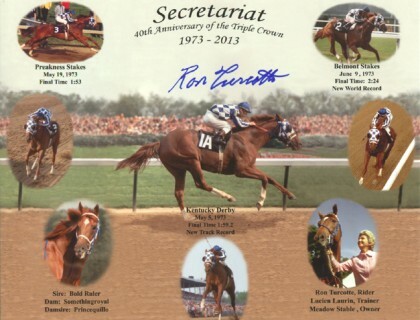 Secretariat was one of racing's greatest stars and collectibles like these often appreciate significantly over time. Comes with certificate of authenticity guaranteeing the signature permanently and unconditionally. FREE SHIPPING & INSURANCE for all U.S. addresses. This spectacular horse racing collectible commemorates the last four Triple Crown winners, Secretariat, Seattle Slew, Affirmed, American Pharoah and Justify. 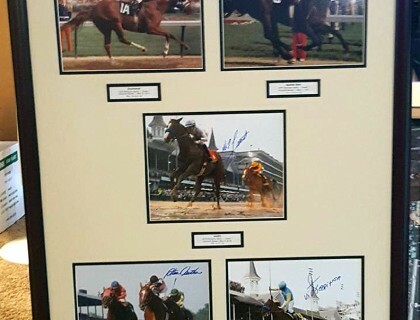 This framed item features four 8" x 10" custom photos of the finish of each winner's Kentucky Derby signed by the winning riders Ron Turcotte, Jean Cruguet, Steve Cauthen, Victor Espinoza and Mike Smith. These signed photographs are double matted in gallery level mat board. Finished in a mahogany frame moulding measuring 27" x 37" approx. This item is a great fit and ready to hang in your home or office. Secretariat, Seattle Slew, Affirmed, American Pharoah and Justify were and are racing's greatest stars and collectibles like these often appreciate significantly over time. Comes with certificate of authenticity for all signatures. Free Shipping and insurance to all U.S. addresses. American Pharoah win in the prestigious 2015 Breeders' Cup Classic at Keeneland Racecourse in Lexington, Ky., winning his final race in dominant fashion. Jockey Victor Espinoza rode the 3/5 favorite from the fourth gate to the horse's seventh win in eight races in 2015, winning by a whopping 6½ lengths over 32/1 shot Effniex and Honor Code. Own a piece of racing history. 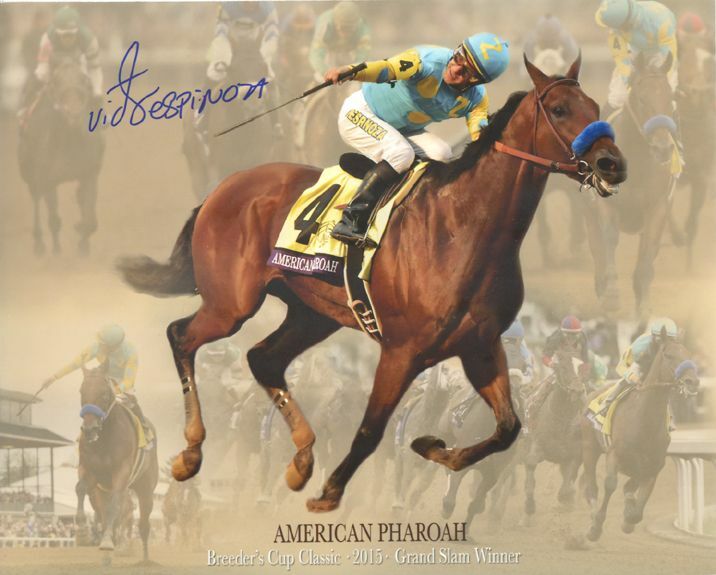 American Pharoah 2015 Triple Crown Commemorative. 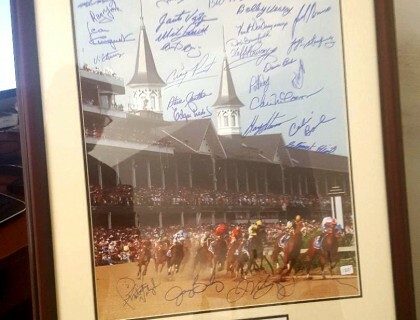 16x20 print signed by 30 Kentucky Derby winning riders. Free Shipping to all U.S. addresses. Signd by Turcotte, Mangenello, York, Cruguet, Espinoza, Santos, Vasquez, Smith, Baeza, Perret, Cauthen, Prado, Franklin, Boland, Ussery, Desourmeaux, Brumfield, Pincay, Erb, Day, McCarron, Stevens, Rosario, Velasquez, Chavez, Borel, Elliott, Valenzuela, Bailey, Velazquez. If you love Horses and Horse Racing, Horse Racing Treasures provides a diverse and wonderful mixture of Handcrafted Equestrian Jewelry and Horse Racing gifts from the Ripley Collection along with Timeless Collectible Horse Racing photos from the Gallery of Champions. All the treasures found here were designed with the hope of sharing all the beauty and wonder that the artist feels during the creation process. At this time we are offering Horse Racing photos, framed or unframed for you to choose from, signed or unsigned Horse Racing photos as well. Horse Racing Treasures is the only US Distributor of the beautiful custom Gold and Sterling Silver Equestrian Jewelry from the "Ripley Collection". We are also proud to carry the Ripley Colors Collection where you can send us a picture of your Jockey silk Colors and the Jewelry will be custom designed to match Your colors. We can also create Jewelry from your own Horse photo, please e-mail us for details & please include your Horse Photo or Jockey Silk Colors within your e-mail. 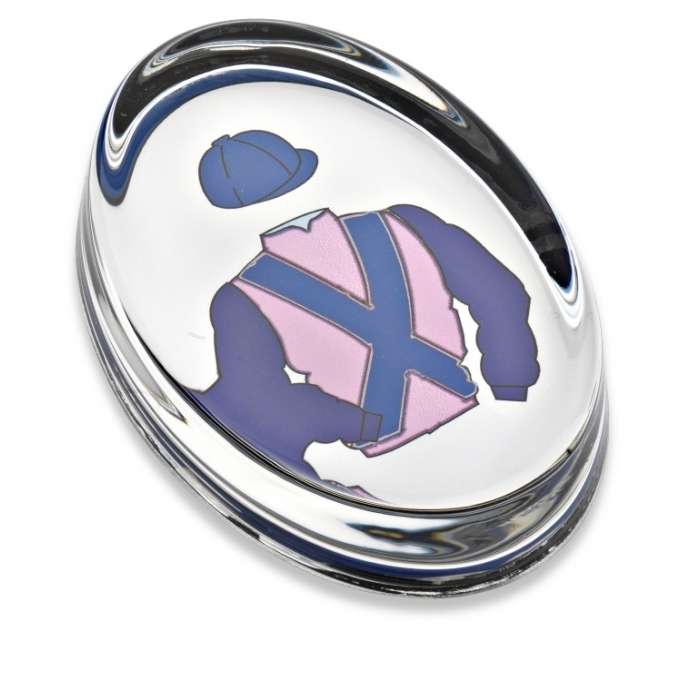 Special occasions are great time for giving and receiving Horse Racing gifts and will make the perfect gift for the Horse or Race Horse enthusiast. A Uniquely beautiful gift of quality is to be treasured. Horse Racing Treasures provides all this and more. We will continue to expand our inventory of Unique Horse and Horse Racing Jewelry along With Timeless Collectible Horse Racing Photos. Please e-mail us and tell us what you think about our Website. We are always happy to do Custom orders. Just e-mail us at: horseracingtreasures@earthlink.net or contact us at: 714 333-6848 Please Allow 4-6 weeks for delivery. "Colors Brooch", available in sterling silver, 18 carat gold plated or 9 carat gold. Actual size: 25mm x 18mm and it comes in a black presentation box. A choice of sterling silver, 18 carat gold plated or 9 carat gold stud earrings, customizable with your racing colors. They come in a black presentation box. 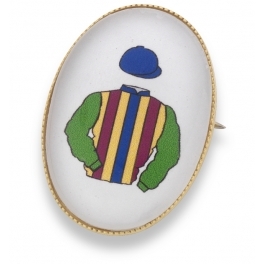 This horse and jockey brooch is available in Red, Blue, or Purple 18ct gold plated embedded with cubic zirconia's, it certainly becomes an eye catching piece of jewelry. The jockey can be fully personalized with your colors. 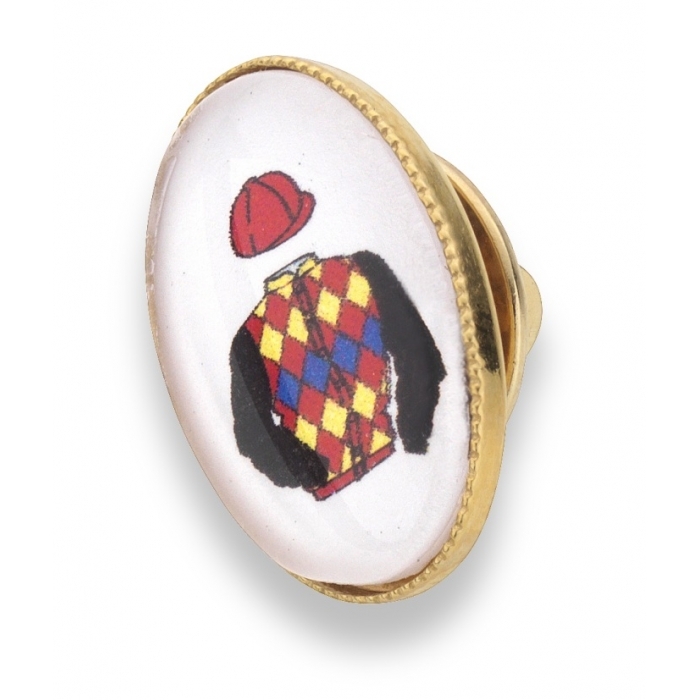 An ideal gift for the equestrian lover, so stand out at the races, any social occasion or just for everyday wear. Actual size: 47 mm nose to end of tail, when sent to you it comes in a black presentation box. Your colors inserted into a pendant(18mm x 13mm) hanging from a 40cm chain, available in: sterling silver, 18 carat gold plated or 9 carat gold, exclusive to you it comes in a black presentation box. Have your own colors inserted into this oval(18mm x 13mm) lapel/tie pin, available in sterling silver, 18 carat gold plated or 9 carat gold. Comes in a black presentation box. 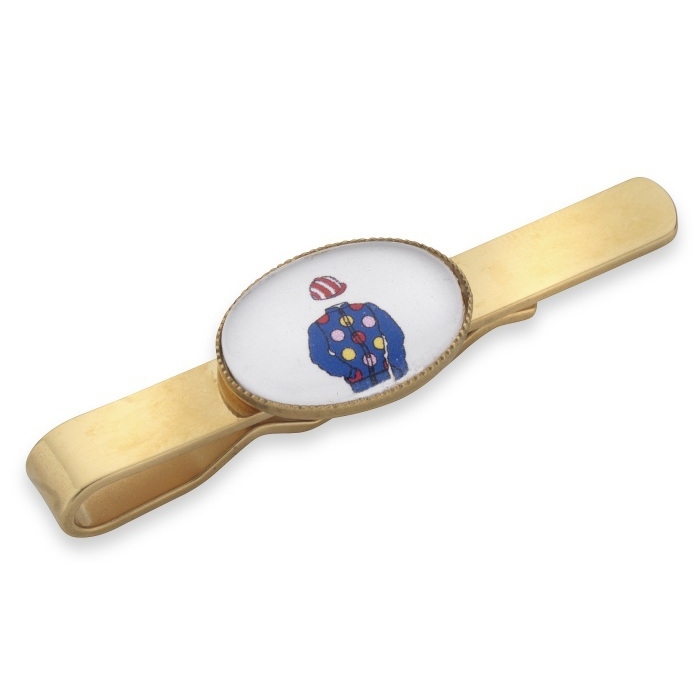 Recently, I bought a tie slide from Horse Racing Treasures customized with my racing silks. HRT did an excellent job of capturing my racing silks on the tie slide. Also, the tie slide itself was of the highest quality. I proudly wear the tie slide including when I have to go to Court for my law practice. I have received many compliments from those who have seen the item and I wouldn't hesitate to purchase another custom item from HRT. An 18ct gold plated, 9 carat gold or sterling silver tie slide with a crystal/glass oval measuring 18mm x 13mm. Customizable with your racing colors, sent in a black presentation box. Thank you so much for making my custom order so easy. You were so helpful from the start; and the cufflinks are so awesome! I am beyond thrilled with the product! From my inquiry email to the final product, this was an amazing experience! 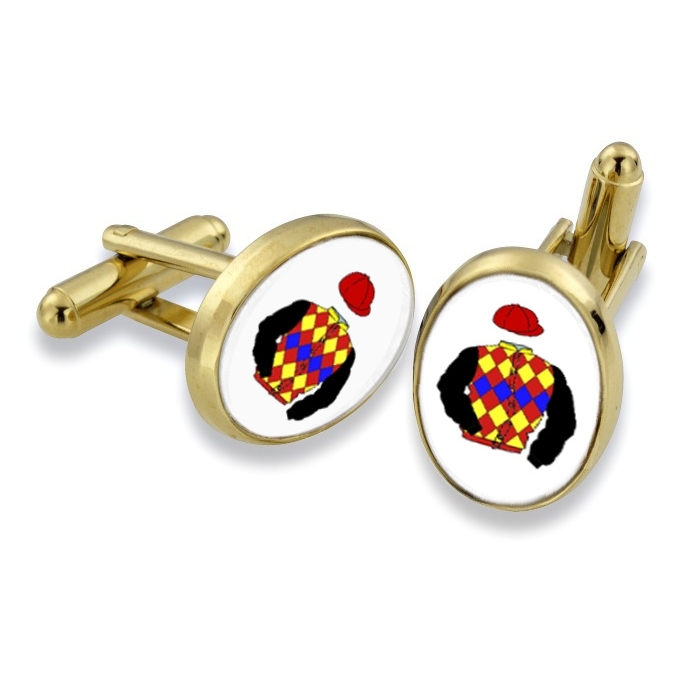 These equestrian colors themed cufflinks are great for that special occasion or a day at the races. 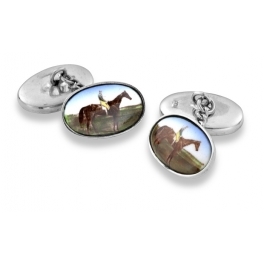 All cufflinks are available in a choice of 18ct gold plated, sterling silver or 9ct gold settings and can be personalized with your colors, or a picture from one of your favorite horses, they come in a black presentation box. Solid glass paperweight, have your own "colors" embedded into the body. Actual size: 92mm x 60mm. Your Horse, Pendant and Chain. FREE Shipping to all U.S. Destinations. The Easy Way To Plan & Pay! Buy the things you want most, using a flexible payment plan that fits your budget, with no credit check, and best of all, no debt. 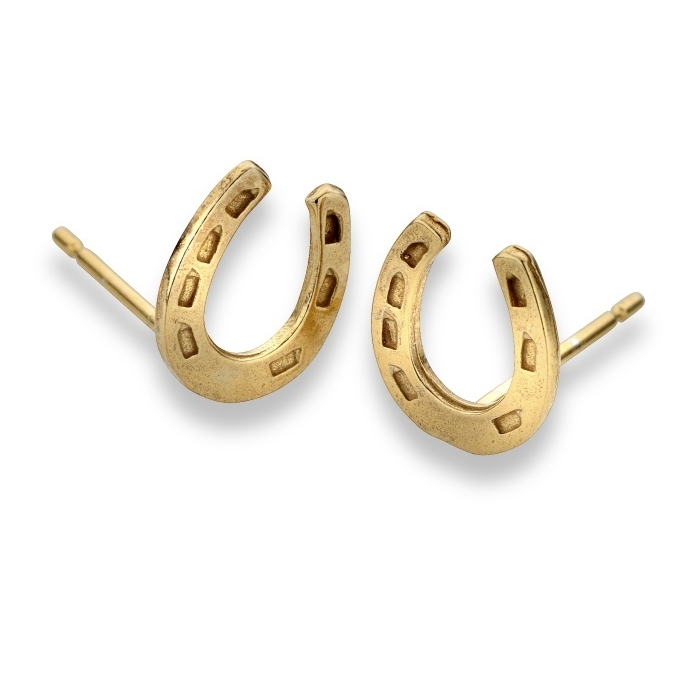 A pair of 18 carat gold plated horseshoe shaped studs sitting 8mm high. They come in a stylish black presentation box. 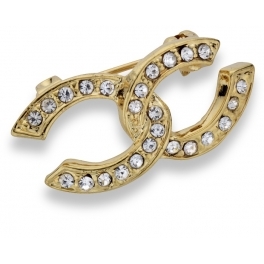 This 18ct gold plated horse shoe has cubic zirconia embedded into it. The equestrian themed horseshoe brooch is a timeless piece of jewelry, measuring 25mm long it will make you sparkle in a crowd. The horseshoe is known to bring luck, why not bring the luck into your life, or give one to someone else, it comes in a black presentation box. Sterling silver boot pendant, 13mm in height. Comes with a 40cm sterling silver chain, in a black presentation box. 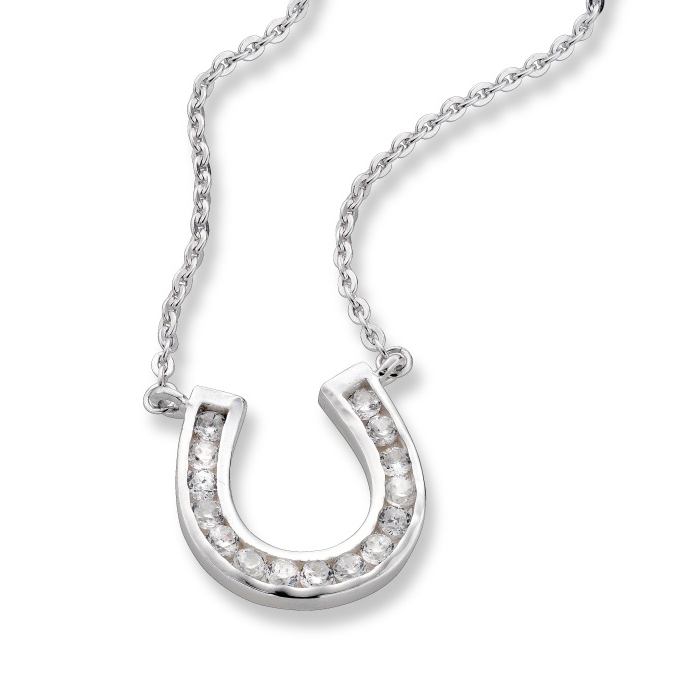 The horseshoe is crafted from Sterling Silver, it is 20mm in height, adorned with dazzling Cubic Zirconias, it is in the centre of a 19cm chain. It comes in a black presentation box. Sterling silver horse head in a horse shoe pendant on a 23cm long sterling silver snake necklace. It comes in a black presentation box. 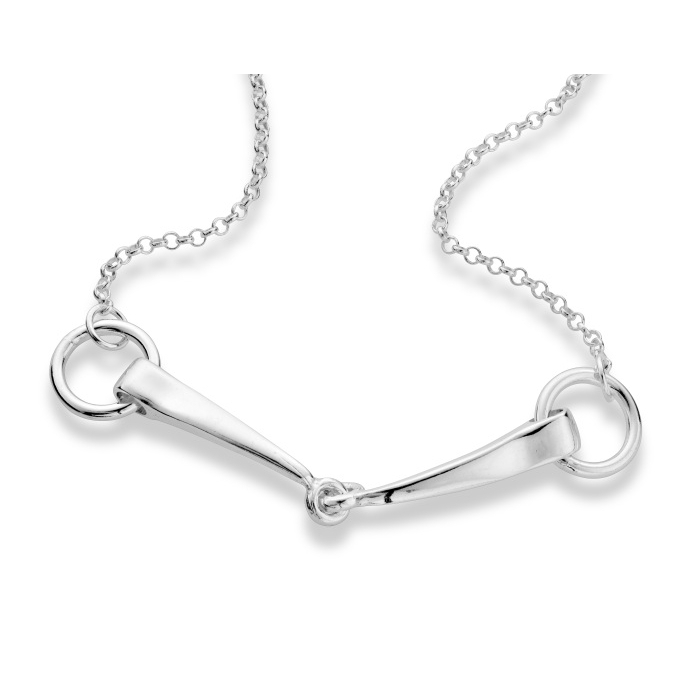 This snaffle necklace has detailed snaffle links and is perfect as a gift or to wear yourself. Our snaffle bit necklace is 40cm in length, the pendant is 13mm in height, it is really elegant, a real show stopper. It comes in a black presentation box. 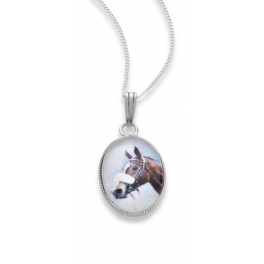 This simple sterling silver racehorse with jockey necklace. Perfect for any collection. The chain is 40cm long, the racehorse is 23mm long. It comes in a black presentation box. 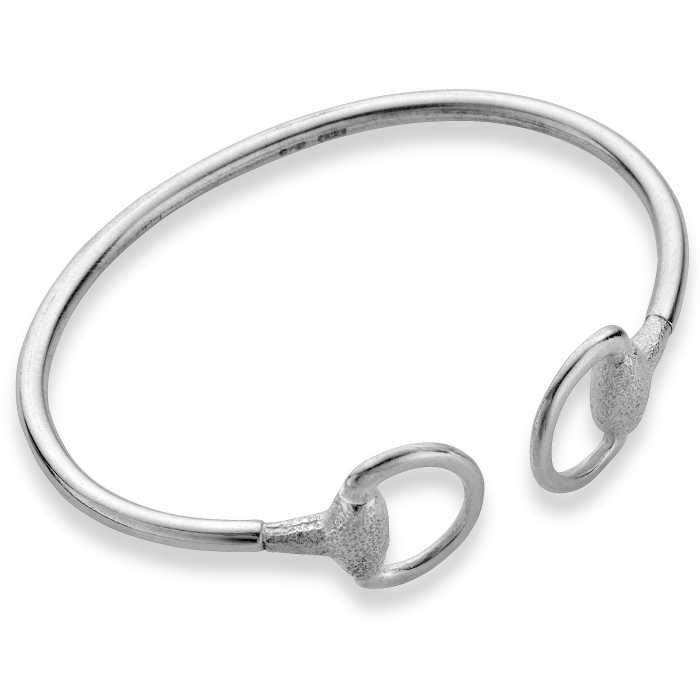 As part of our horse jewellery (jewelry) range, this bangle is designed as a single bit in sterling silver. Practical and durable, it can be worn everyday or for any special occasion and would make the perfect gift for the horse enthusiast in your life. 6cm in length, it comes presented in our black presentation box. 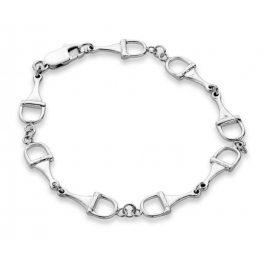 A sterling silver bracelet, it has 3 snaffle bits interlinked, altogether it measures 20cm in length, it comes in a black presentation box. 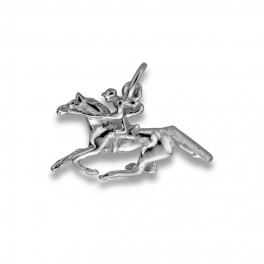 An elegant sterling silver swivel cufflink with a horse and jockey at a gallop. An ideal gift for the equestrian enthusiast. Actual size: 16mm x 10mm high. Comes with a black presentation box. 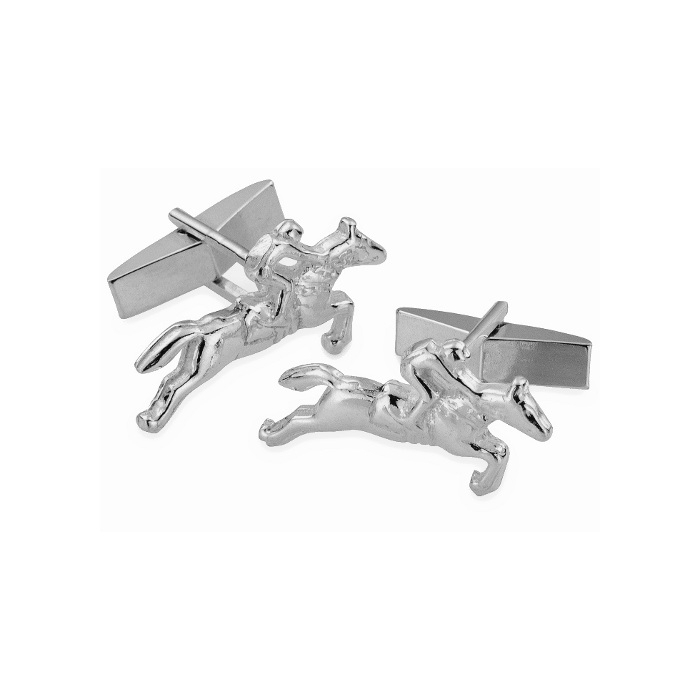 sterling silver cufflink, chain linked, with an enamelled image of a racehorse. The perfect gift for all equine enthusiasts. Comes complete with our black presentati case. Actual size: 16mm x 10mm. 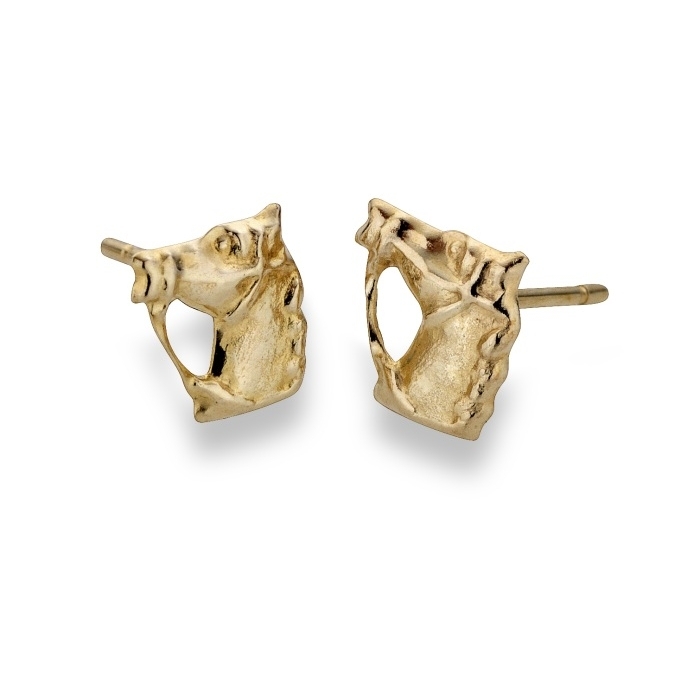 9ct Gold Horse Head Stud Earrings. A nice little stud standing 12mm in height, made from 9ct Gold, they come to you in a black presentation box.